Pirelli Glass Ltd. is best known for their involvement with Vasart and Strathearn, as well as for their sets of Guinness animals. However, they also manufactured a range of lampwork animals and did glassware decoration. 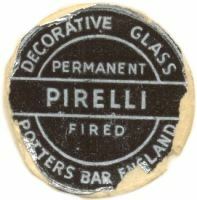 Pirelli had showrooms in London and Hertfordhire, where they also sold the glass and pottery of other glassmakers. 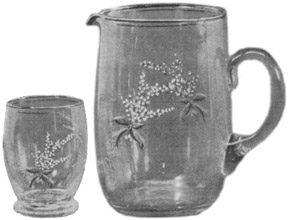 It is not unusual to find decorated glassware with a circular Pirelli label, as shown on the right. It is not known if these were decorated at the Pirelli premises, at Vasart’s premises or elsewhere — likely a combination. They did did not make the glassware. 2008 - upodated with glass names from 1959 catalogue. Size: 115mm 4½" high. Two gilt lines at rim, multicoloured transfer for ‘Coronation of Queen Elizabeth June 2nd 1953’. Round Pirelli label under base. Size: 180mm 7" high. 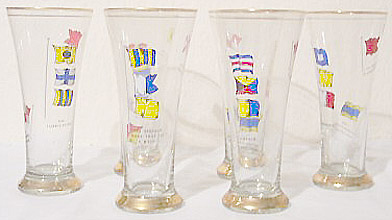 Each glass has a different message set out in flags. Pirelli round labels. Size: 62 mm 2½" high. Plain boxed set of 6. Each has salutations in 3 different languages and various colours, gilt band at rim. Leaflet in box has translations of ‘Good Luck and Good Health’ in many languages. States ‘Permanently fired by Pirelli Glass Ltd’. No labels. Egészégere - Skål - lang may your lum reek! Na Irdair! - Prosit! - Chin-Chin! Salud! - A votre Santé - Good Health! Slàinte! - Salud y Pesetas! - Salute! Iechydda! - Saude! - Cheerio! Bottoms up! - Hei-Hei! - Op uw Gezondheid! 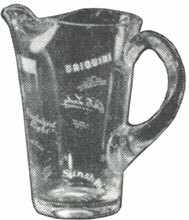 Size: 115 mm 4½" high. This mug is of great interest as it bears a Pirelli circular label and a pottery mark that dates to August 1944, shown in article. It also carries the same decoration as the set of glasses above. 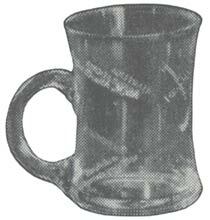 The mug was made shortly before Pirelli was set up and thus implies that the circular label was in use from 1945. Size: ?. 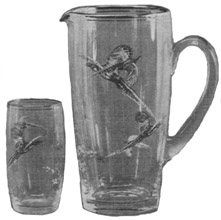 These 3 pieces were shown in a Pirelli advert in ‘Pottery & Glass’, in both 1959 & 1960. The earlier speculation that the design dated much earlier is not disproven, but it is less likely that they would be advertising a line nearly 15 years after its introduction. It is not impossible either! More evidence is needed. The advert is shown in the article. The advert copy included: “Good Health” in 24 different languages. None show in 1959 catalogue. Size: ?. From Pirelli advert ‘Pottery & Glass’ 1958. Sold as 7 piece sets. Black & White images from an original Pirelli Glass Ltd. advert. Courtesy of Angela Bowey. Original advert can be seen in her article at the Glass Encyclopaedia on line. 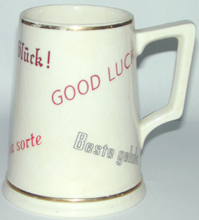 Gary Millar for the Morley Ware mug with a dated mark. 1959 catalogue with thanks to Rakow Library.